Over the last 24 years, our vendors, customers, and employees have helped us to raise over $2.6 million for the Make-A-Wish Foundation. We’ve granted countless wishes to those who deserve them the most and, with your help, we will surpass $3M this year in lifetime donations in support of Make-A-Wish! This is our 25th annual Make-A-Wish fundraiser and we have a special event planned. 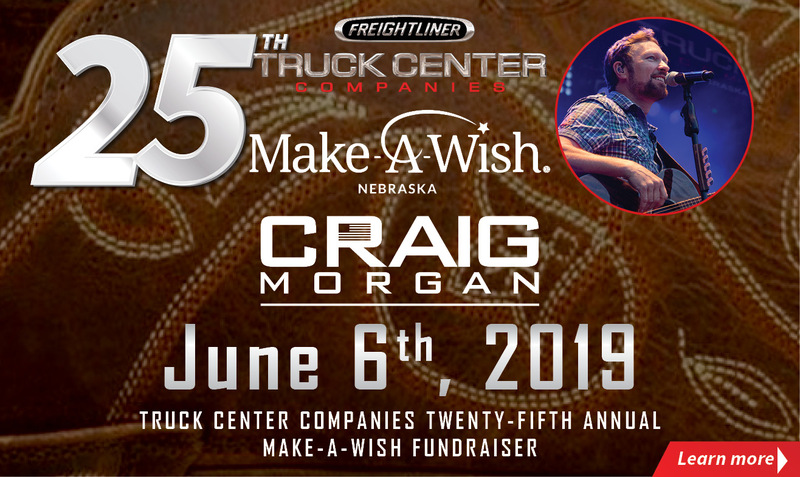 Thursday, June 6, 2019, we kick it off with a concert at the Truck Center Companies Training Center in Omaha with Nashville recording artist and Grand Ole Opry member, Craig Morgan with special guest, local musician, Dylan Bloom. We will have special appearances of Wish Kids, along with live and silent auction items. Food trucks will be available donating 10% of their sales. With your donations, we will put on an event to support children with critical illnesses and lift them up during their difficult times! Let's make the most of this opportunity to make a difference in the lives of these kids and their families. Please join Truck Center Companies for our 25th annual Make-A-Wish celebration and let’s make sure that every one of these children has a chance to make their dreams come true! ALL proceeds go to Make-A-Wish Nebraska! New Trucks Keeping You On The GO!